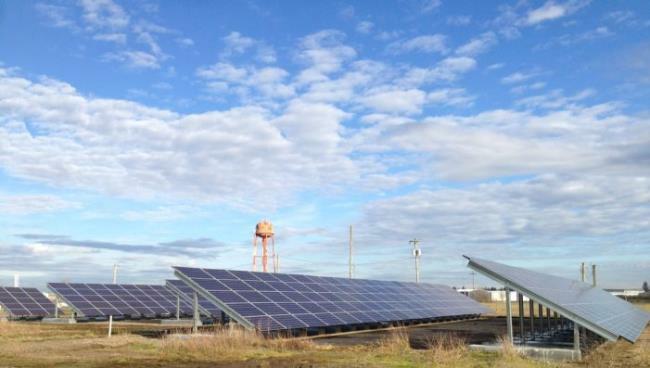 The City of Corvallis invites you to attend the grand opening of a new 100 kW solar array that has been installed at the Corvallis Municipal Airport. Representatives from the City of Corvallis, Pacific Power and Energy Trust of Oregon, as well as elected state and local leaders, will officially dedicate the new installation at 2 p.m. August 28 at the airport, 5695 SW Airport Ave. The new array will produce enough energy to power nearly all of the City of Corvallis’s daily electricity needs at the airport. It was installed on a former superfund site that is in the final stages of environmental remediation. To avoid disturbing the site’s soil, the 378 individual solar panels that comprise the array were installed above-ground in a series of concrete-filled troughs. The array feeds into Pacific Power’s electricity grid. Funding for the $273,712 project came primarily through a grant from Pacific Power’s Blue Sky program, which funds community renewable energy projects in Oregon, Washington and California. The balance of the funding was provided by the Energy Trust of Oregon, a nonprofit organization that promotes renewable energy projects throughout Oregon. Thanks to the generous contributions from Pacific Power and the Energy Trust, the City of Corvallis incurred no out-of-pocket cost on this project. The public can view real-time energy generation, as well as sustainability metrics, online at www.corvallisoregon.gov/airportsolar.